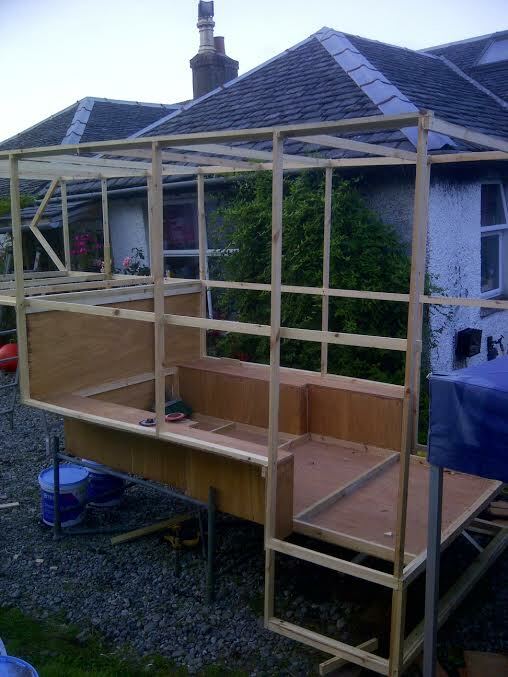 Some of you may know I built my own Demountable last year and recorded the process in pictures and blurb on another site. With the help of our new Site Admin, and if there is any interest from the members here, I propose to recreate a timeline for the process and list some of the problems which had to be overcome along the way. A few months were spent in deliberation and a basic design evolved. 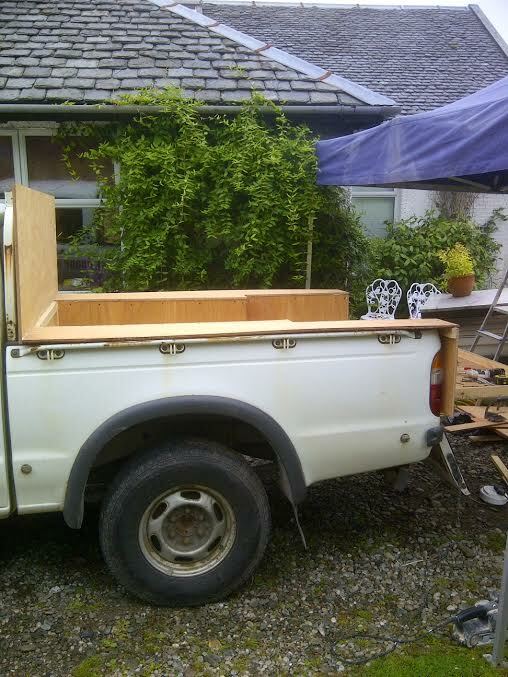 It was to be no wider than my truck, have a bed in the over-cab area - which would need to be north-south rather than across - and have a right proper flushing loo. It also had to be easy for my missus to get in and out with her gommy knees. 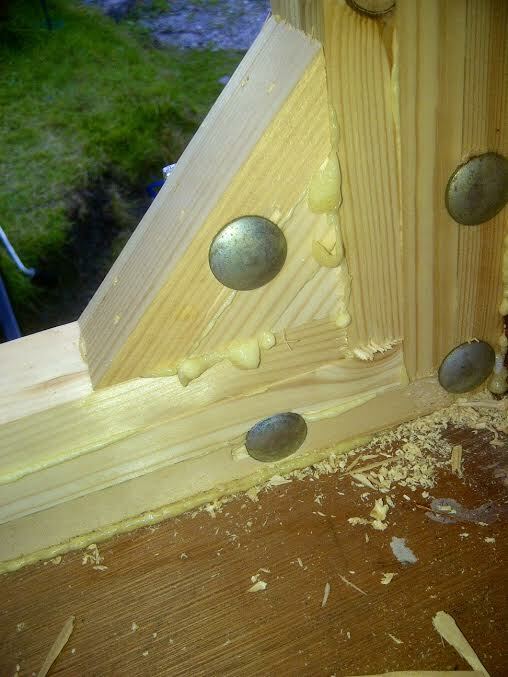 The basic construction is a softwood frame with a bonded plywood skin outside and inside, insulated between skins with 50mm of Kingspan (Celotex). I had experience of this building method, it produces a strong, light structure, this combination being essential for the job. Here"s hoping we can resurrect the old photos and text in some kind of a sequence. I started the build today. 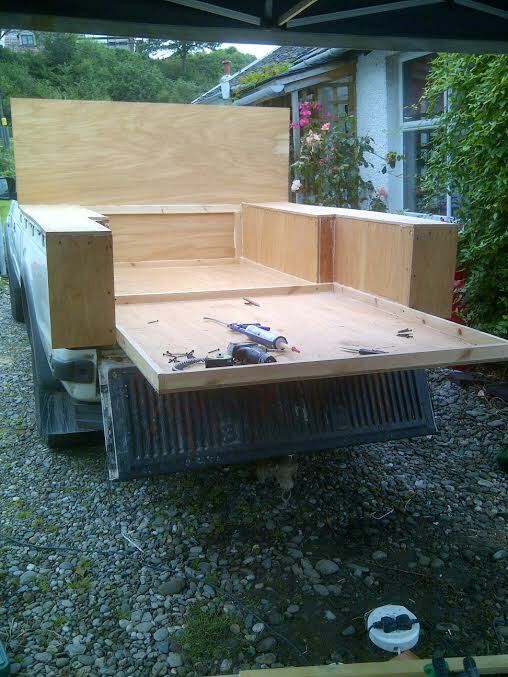 12mm marine ply tub up to the level of the truck body, framed and braced with 22x44 and glued up with foaming polyurethane waterproof glue. I've chosen caravan steadies for the rear, which will be used to stabilise the rig when parked for sleeping. I ordered a couple of farm trailer steady jacks to lift the front end of the camper, I just have to fashion a strong fixing point for them. I don't expect to take the front legs away on trips since we wild camp one night at a time so we don't need to dismount the camper while we're away. 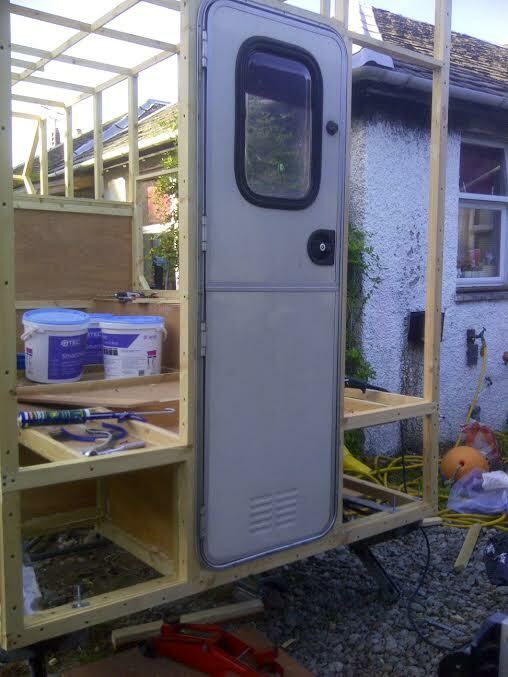 I got a recycled caravan door complete with frame from a breakers yard, who also sold me an electric flushing loo and a zig unit for not much money. So I'm spending on a new waeco fridge and a couple of Seitz windows. I've ordered all LED interior and exterior lamps and a couple of roof ventilators. My Ebay has been very busy and I'll be seeing the Postie most every day for the next week or so. More later as I make progress with the build. 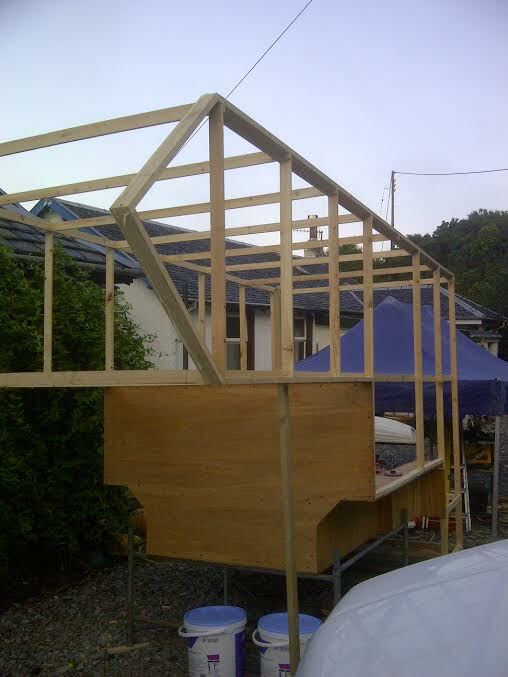 Well, the superstructure went up yesterday and today. Windows came, and I already have the door. I ran out of 44x20 today so I'll be getting more in the morning. Next phase is to make frames for all apertures and fix them into the structure. I changed my mind about the front profile of the luton. It was to have been a truncated triangle but after some head scratching I simplified it to a triangular point. Only two 45 degree cuts and a 90 degree corner. It will be easier to clad and to make weatherproof. Photos to follow if I can impose on zildjian to post them. Many thanks for that. All the apertures have been framed out and test fitted today. The Seitz windows are brilliant and the caravan door was very easy to fit. I cut out the section of floor at the back to allow for an internal stairway. The plan is to create another two step stair which will stow upside-down in the stair well..I'm about ready to start putting on the outside skin. Pictures soon. For the interior we will be keeping to the minimalist approach. Kitchen area will consist of a row of sunken bays on right side of cabin, Waeco cf 25 in the first one, then a recess to fit a plastic washing up bowl, then an aluminium lined recess for a two burner and grill portable stove. Each will have a lift out section of worktop, possibly hinged to fold up, still not sure. A small amount of storage space should be available when the main items have been housed. Clothing and lightweight storage in the luton down one side, in cubby-holes, 1.04 metre bed to fill the rest of the luton. Battery box and heavy storage under sofa on left side of cabin. TV will be mounted on the partition wall at the foot of the sofa/bed in cabin. Toilet just inside the door on the right, wardrobe in area to left of the door. Toilet door to open out and close off the main cabin to create more space in the toilet and give privacy for washing, changing etc. Space beneath toilet floor on right side of stairwell for gas bottle store and toilet chemicals and waste water storage drum (25 litre plastic jerry). Space beneath wardrobe on left side of stairwell for dirty stuff etc. Got quite alot done today. I cut an aperture in the floor and fitted a stairwell, then beefed up the rear frames to take the full weight on the caravan corner steadies. They were a little too long so I used a big diamond wheel to trim them back. Triple reinforced the front jacking points and test fitted the spigot for the front jacks. Front jacks are off to a friendly welder to be extended by 20 inches in the morning. 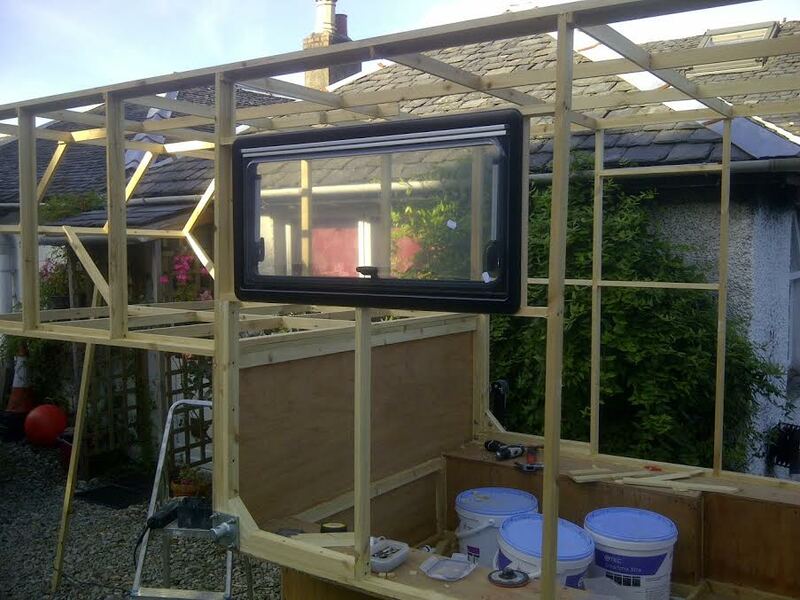 Trial fit of the windows and then jigged everything level in preparation for fitting the skin tomorrow. Don't sound like much, but it took all day. I got the legs welded up with a 20inch extension and fitted this afternoon. The camper is standing unaided now on its own two legs and caravan corner steadies. I also fitted the back and fixed the door on butyl sealing strips and put the skin on under the luton. I dodged the rain showers today and finally got the outside skin fitted. In testament to the monocoque principle of the construction, I was able to stand in the front of the luton once the sides were on. I left out any triangulation in the spaceframe structure to reduce complication and weight and rely on the holding qualities of the glue to maintain the rigidity of the final shell. I must say that I used an excessive amount and much of it was squeezed out when the joints were pinned, but rather that than too little eh!